Abstracta, a modular display system company, adds new Bunch table designs to the ever growing home furniture line. As Abstractas home furniture becomes more and more popular among home owners and interior designers alike, the company has continued to release new products and add to the modern table line. Consort Display Groups president, Roger Lepley, acquired Abstracta and added the line of small tables that would begin the Abstracta Home Furniture collection. Mya tables were created to act as a drink table next to a chair or couch, fill a small space that inevitably turns up when arranging furniture, or as a surface to house a lamp or sculpture. 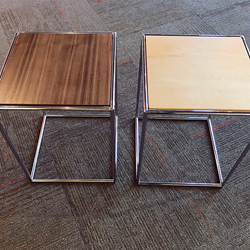 Next up was a set of nesting tables. Comprised of three sizes, the Nesting table set conveniently opens up surface space in a room. Clean lines and open design enhance rooms expanded, nested or placed individually as needed. Bunch and Lamp tables were added next. The Nesting, Bunch, and Lamp tables all originally were sold only with a glass top. The Mya tables are sold with wooden and tile tops. Finally, Abstracta has released the Bunch table with beautiful wooden tops in Maple and Walnut. The Bunch table works as a stand alone piece or, by bunching several tables together a presentation of 3 or 6 makes a stunning centerpiece for larger spaces or unique coffee table use.